Kelsie Montgomery goes for a steal in the Lady Jeeps win over Fairfield on Saturday. 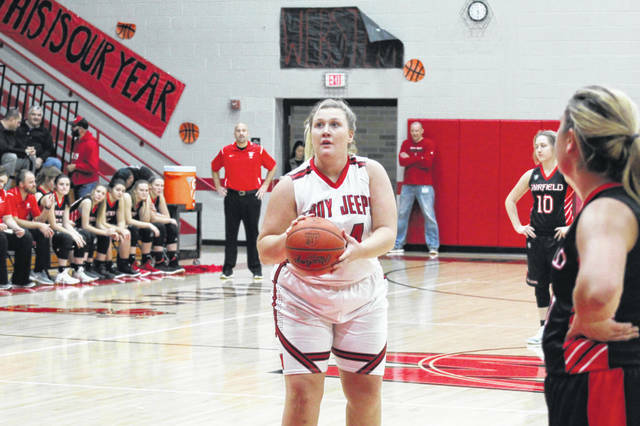 Lady Jeeps senior Maddie Cook had a team high 18 points in their win over Fairfield Saturday. South Webster junior guard Rose Stephens steals the ball from a Fairfield player in their win over the Lions Saturday afternoon. Glenwood’s Tyler Caldwell and Mal Potts force a trap in South Webster’s win over the Tigers Saturday night. South Webster senior forward drives to the basket in the Jeeps season opener Saturday night vs. Glenwood. 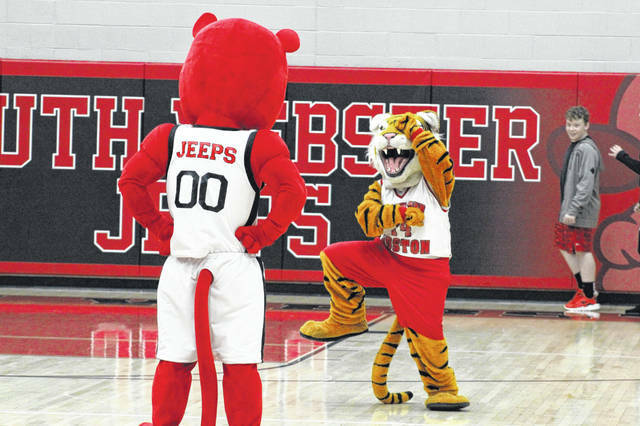 The Jeeps’ mascot and the Tigers’ mascot got into a dance off during halftime of the South Webster Glenwood game Saturday night. 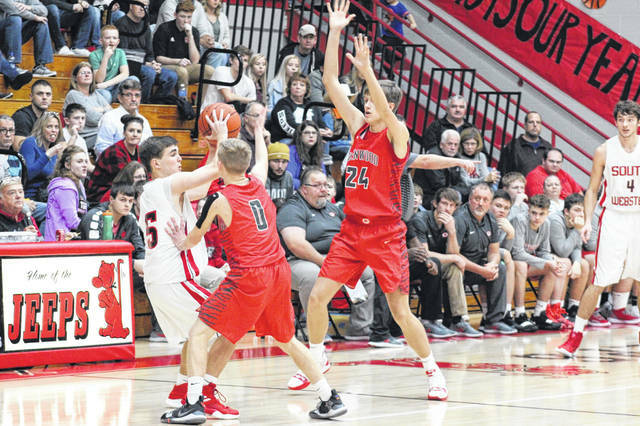 Glenwood senior Tyler Caldwell missed three free throws in the final seconds of Tigers loss to South Webster Saturday night. Shiloah Blevins had a team high 21 points in South Webster’s win over Glenwood Saturday night. In a day that will be remembered as a great day in South Webster, the Jeeps and Lady Jeeps both walked away with huge victories on Saturday over Glenwood and Leesburg Fairfield respectively. 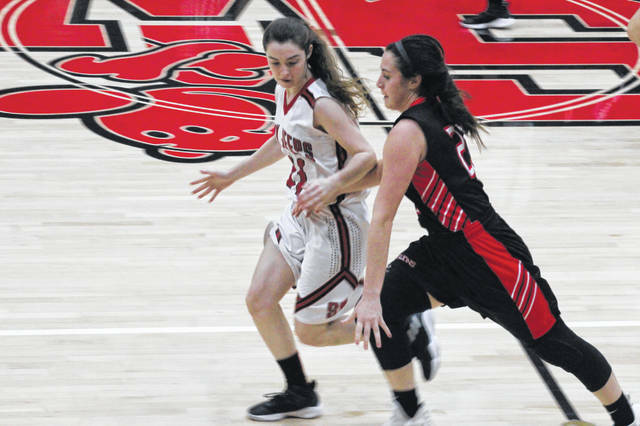 The South Webster Lady Jeeps needed a great defensive performance to take down Fairfield, and that is exactly what they were able to come up with by limiting the Lions to just 41 total points, and 28 of those came in the final three quarters. The impressive defensive effort is exactly what head coach Ryan Dutiel was hoping to see from his team. Maddie Cook, the Trevecca Nazarene University fall signee, had an excellent game to help lift the Lady Jeeps second win of the season. The senior scorer and playmaker hit three threes which helped get her total to 18 points on the night, as well as several assists and double digit rebounds on the Jeeps home court Saturday afternoon. South Webster’s leading scorers for the game, other than Cook who was the team high scorer, include: talented freshman Bri Claxon who finished with 14, Baylee Cox who finished with 11, and guard Kenzie Hornikel who finished with 8 points. The Lady Jeeps will next prepare for the Valley Indians who will come to face them on their home court on Monday as they hope to improve to 1-1 in SOC II play, and a game in which Dutiel knows his team must be playing their best basketball for them to come out on top. An instant classic. For those in attendance on both sides, the heightened level of play from both teams was incredible; From the start when the Jeeps started off 4/5 from three, to Glenwood closing out the first half with a 36-32 lead, to the moment when Tyler Caldwell stepped to the line for three free throws that would have gave the Tigers the lead with under five seconds to play. 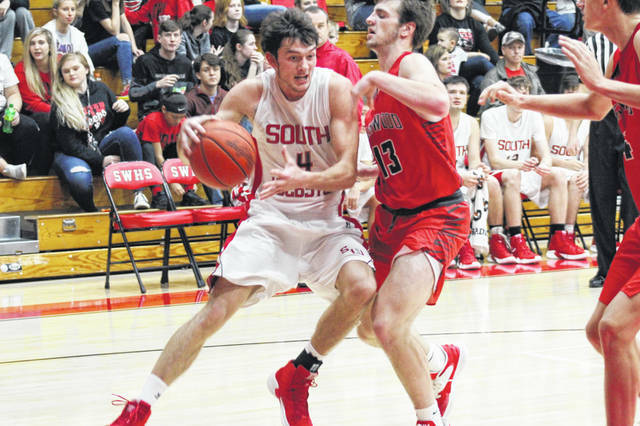 The rematch of March’s district semifinal game which saw South Webster victorious lived up to all the hype and expectations. 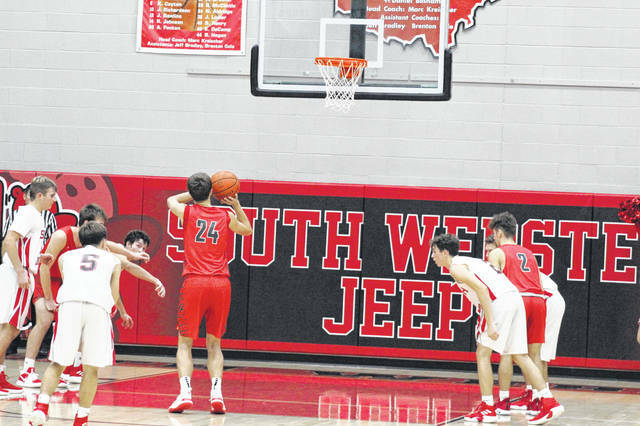 The Jeeps came out on top in the end thanks to the play of two players who really excelled when their team needed a basket or a big play on the defensive end: senior forward Shiloah Blevins who finished with 21 points and sophomore Tanner Voiers who finished with 13 points. Cox was pleased by the play of Caldwell and Sexton, who each broke the 20 point mark with 23 and 20 respectively, even though his team fell just short in the waning moments of their first road game of the season. Cox was also very complimentary of his opponents, many of which he himself helped coach in soccer when they were in middle school. The Tigers will get a week off from games before they travel to Symmes Valley next Friday night to face the Vikings in their opening SOC I game of the season. 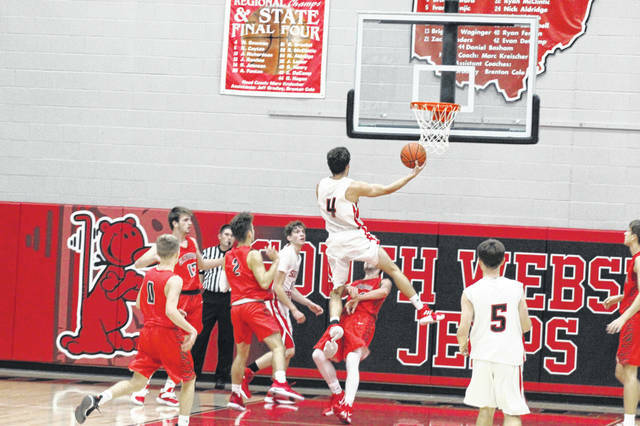 As for the Jeeps, Cole’s group will host the Fairland Dragons of the OVC on Tuesday in hopes to claim their second win of the season. https://www.portsmouth-dailytimes.com/wp-content/uploads/sites/28/2018/12/web1_IMG_3633-1.jpgKelsie Montgomery goes for a steal in the Lady Jeeps win over Fairfield on Saturday. 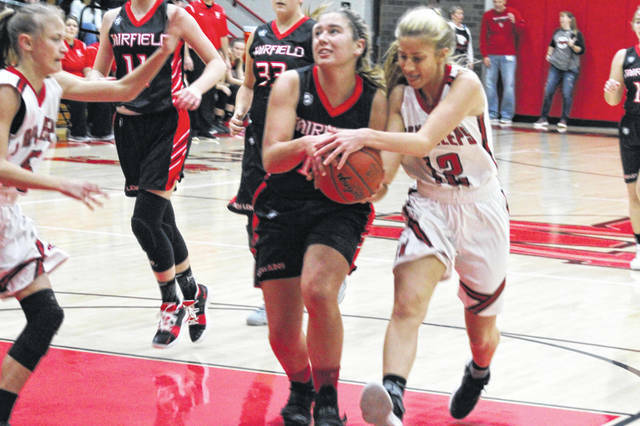 https://www.portsmouth-dailytimes.com/wp-content/uploads/sites/28/2018/12/web1_IMG_3653-1.jpgLady Jeeps senior Maddie Cook had a team high 18 points in their win over Fairfield Saturday. https://www.portsmouth-dailytimes.com/wp-content/uploads/sites/28/2018/12/web1_IMG_3613-1.jpgSouth Webster junior guard Rose Stephens steals the ball from a Fairfield player in their win over the Lions Saturday afternoon. https://www.portsmouth-dailytimes.com/wp-content/uploads/sites/28/2018/12/web1_IMG_3760-1.jpgGlenwood’s Tyler Caldwell and Mal Potts force a trap in South Webster’s win over the Tigers Saturday night. https://www.portsmouth-dailytimes.com/wp-content/uploads/sites/28/2018/12/web1_IMG_3807-1.jpgSouth Webster senior forward drives to the basket in the Jeeps season opener Saturday night vs. Glenwood. https://www.portsmouth-dailytimes.com/wp-content/uploads/sites/28/2018/12/web1_IMG_3826-1.jpgThe Jeeps’ mascot and the Tigers’ mascot got into a dance off during halftime of the South Webster Glenwood game Saturday night. https://www.portsmouth-dailytimes.com/wp-content/uploads/sites/28/2018/12/web1_IMG_3950-1.jpgGlenwood senior Tyler Caldwell missed three free throws in the final seconds of Tigers loss to South Webster Saturday night. https://www.portsmouth-dailytimes.com/wp-content/uploads/sites/28/2018/12/web1_IMG_3855-1.jpgShiloah Blevins had a team high 21 points in South Webster’s win over Glenwood Saturday night.